You’ve probably heard by now that learning a foreign language is good for the brain. This is true in the sense that using a second language on a regular basis seems to help build up cognitive reserve. This results from bolstering certain connections in the prefrontal cortex (the part behind your forehead) involved in the process of switching from one language system to another. The linguistic “gear-shift” mechanism of the brain actually involves a vast network of interconnected neurons spanning every lobe of the brain. They constantly re-organise themselves on a trial and error basis (but only if you regularly use both languages) in order to help the person get better and better at using all their brain resources with slightly greater flexibility than people who only speak one language from one week to the next. The cognitive demands involved in learning a new language are vast. Once the endless list of words have been memorised, the grammatical quirks of each language finally mastered, our brains will have physically changed themselves, having updated the brain’s wiring to have neural networks capable of communicating using either of the learned languages. 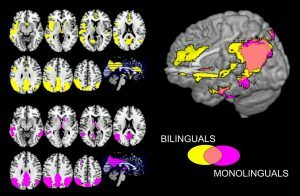 The ability to switch between two languages turns out to be great cognitive exercise which results in the development of cognitive reserve that can come in to play in later life to compensate for problems caused when bran cells die off in large numbers due to neurodegenerative conditions. Cognitive reserve is something that we would all be well advised to put time and effort into developing. And beyond that many people find the motivation to put themselves through the extensive process of learning a language because they know that when traveling overseas, communicating with the locals in their own language improves the quality of your experiences exponentially. Because most people don’t bother, it really does differentiate a English native-speaker if they actually do try to speak a foreign language. It opens so many doors, helping you gain access to experiences that simply wouldn’t be on offer when the communication barrier gets in the way all the time. Surprisingly, it turns out that, the technology may already be at hand to help people clock up enough hours of interaction in a new language to make relatively fluent communication easier to achieve, for keen computer gamers at least. 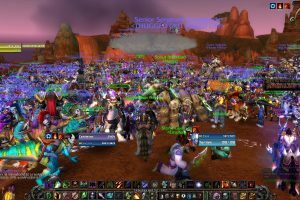 The study I stumbled upon during my latest exploration of the science journals looked at the impact of playing Massively Multi-Player Online Role Play Games (MMORPGs) on language acquisition. It had been postulated that, for example, when MMORPG gamers sit in front of their computers – each in a different country, wearing headphones / mics so they can coordinate their battles with dragons, dwarves and elves – they may end up improving their command of a non-native language. Under such circumstances, English is usually the language that everyone has in common and people end up getting hundreds of hours per month experience of listening to and speaking in this non-native tongue, due to the need to stay in constant contact with each other to coordinate everyone’s efforts to win the game. So seeing as people are already doing this, all the researchers had to do was track these people down and compare them to people who don’t play those kinds of games. This hypothesis is perfectly cogent in terms of how neuroplasticity works. This is because the brain only invests resources in reinforcing and bolstering neuronal pathways that are used regularly, intensively and over long periods of time. Given that some people on the Steam Wall of Shame – a list of how many hours individual gamers have clocked up playing online games – do it for more hours each year than can be accumulated during a 52 week year of working 9-5, these pre-requisites all seem adequately covered. Peterson, M. (2011). Digital gaming and second language development: Japanese learners interactions in a MMORPG. Digit. Cult. Educ. 38, 289–299. In addition to these monthly brain blogs, I tweet about brain-related research that hits the press on a daily basis (@drjacklewis) and do a fortnightly podcast about recent quirky science stories called Geek Chic’s Weird Science. I have a new book – The Science of Sin – coming out next month in the UK (pre-order here) and in September in the USA (pre-order here). It now has its very own website where you’ll soon be able to find some video footage of a speech I gave from a soapbox at Speaker’s Corner and a fun quiz to help people work out which of the Seven Deadly Sins is the temptation they struggle with the most (www.sciofsin.com).